On this basis, Hobbes affirms that “‘The Right of Nature,’ … is the liberty each man hath to use his own power as he will himself for the preservation … of his own life.” (Ibid. Ch. 14) For Hobbes, this natural right is not even limited by the rights of others. 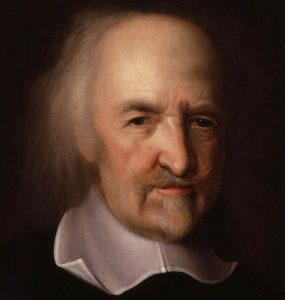 On the basis of his idea of the state of warfare and the natural right of human liberty, Hobbes argues that, in fact, the only way that human beings can find security is by handing all of their rights into the hands of an absolute sovereign (the Leviathan) who will then rule them all, granting to them whatever “civil rights” he deems appropriate. While Hobbes’ solution to the problem of the natural state of warfare of every man against every man did not, in the long run, gain acceptance in the West, modern Western political philosophy has been driven by his underlying view of the human problem. Indeed, if we consider the reigning ideology of absolute personal liberty, we can see that it shares the basic Hobbesian view of human nature, but seeks rather to maximize the liberty while minimizing the government mediation between conflicting liberties. This idea also leads to the primacy of the economic role of government on the idea that conflict between human beings will be lessened in the midst of material prosperity, but exacerbated when competition for scarce material goods is greater. There is another consequence to this worldview: moral virtue is impossible and can never be any more than a fiction or illusion. Hence the political-economic-social order of a society has nothing to do with virtue, but can only be managed as a machine in which the human beings are the moving parts that are to be harmonized in their functioning so as to produce an efficient economic engine. Of course these ideas are not the only ones that shape our society, but their pervasive influence should be quite evident. It should also be clear that Hobbes’ starting point of the natural state of warfare of every man against every man is very misguided to say the least. It treats humanity as a collection of individuals with no natural bonds one to another. It altogether overlooks those most fundamental of bonds, the umbilical cord and the nursing breast, not to mention the indissoluble bond of married love between a man and woman that gives rise to the bond of the umbilical cord. It overlooks the selfless and self-sacrificing love of parents. Finally, it overlooks the family as the natural cradle of human life. Certainly the reality of sin in the world often brings a sort of unfortunate “warfare” into the heart of the family, but this is a secondary, not primary reality of human life; Eden came before the Fall and the Fall did not totally destroy the good of nature that was given in Eden; further, the grace of Jesus Christ has entered the world to heal the wounds of sin, to reinforce the bond of marriage, and to make possible the truth of love. In that light the family is the natural school of moral virtue. What is virtue? It is not a mechanical reality, but the direction of human instinct and energy towards the true, the good, and the beautiful, under the light of faith and reason. In that light, government, rather than managing human beings as cogs in an economic machine, should be protecting family life and fostering the promotion of virtue. This entry was posted in Featured and tagged Economics, economy, Hobbes, Leviathan, liberties, Materialism, rights, Thomas Hobbes by Father Joseph Levine. Bookmark the permalink.